Half the fun of really good horror is suspense. It’s waiting on bated breath for something to happen: a jump scare, gore, a shadowy figure looming in the background. It’s nice when a film knows how to build something, and equally, when to stop and give us a payoff. There’s a short film I found recently that typifies this. 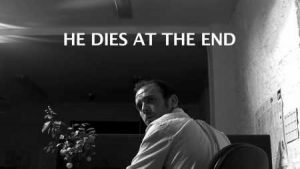 I present to you Damian McCarthy’s He Dies At the End. Click here for He Dies At the End. I can’t stress enough how much I appreciate a film where the actors look like normal people. Our only actor, Fintan Collins, looks like someone with whom I’d work, which makes the story more realistic and therefore more terrifying. Collins didn’t have to talk, as McCarthy made sure that the action was driven by a computer survey. This in and of itself was a huge feat, as it’s tough to get scared while someone is typing. The chills came from what was being typed, which made the process that much more scary, as it had a chat-room/surveillance type feel to it. No one likes being watched in that close of capacity, and many of us have that fear that there is something there, watching us, waiting to pounce. While the end scare could have been better done, I’m giving it a pass for the sheer level of building paranoia and discomfort that McCarthy gave us.